Spyker Cars NV, the Dutch parent of Saab, said the Swedish automaker's financial situation is worsening and warned that Saab's future is at risk without additional financing. In its annual report released Friday, Spyker said the company's "continuity" could become uncertain unless it secures extra funds to finance ongoing operations and the execution of its business plan. Earlier this week, Saab had to shut down production for short intervals after key suppliers halted parts deliveries for non-payment. Spyker said it had negative cash flow in 2010, mainly due to operating losses at the Saab Automobile and the Spyker Automotive businesses, as well as from its capital expenditure program for new Saab models and the re-activation of Saab's production and sales and marketing operations after Spyker bought Saab from General Motors Co. in February 2010. "Although this was anticipated in the business plan the actual cash need was higher than planned," Spyker said in the report. To bolster its finances, Spyker CEO Victor Muller is focusing on Russian businessman Vladimir Antonov, who has submitted an application to take a stake in Saab. Antonov was forced out of the original deal in which Spyker bought Saab from GM after media reports of links to organized crime. He has said he has cleared his name and that GM is ready to have him back in the agreement. Sweden's Debt Office, which has a say in ownership changes, is in the process of considering Antonov's application. Muller has said that Antonov, who owns a bank in Lithuania and Latvia, is keen for his bank to lend a "significant" amount to Spyker, though he said the amount would be less than the 400 million euros European Investment Bank loan that Spyker already has with Swedish state guarantees. Muller also said Spyker was in talks with large European and U.S. banks about a 500 million euros credit facility to replace the EIB loan and Swedish government guarantee. The funds are for working capital, as the EIB loan can only be used for 80 pre-determined engineering projects. 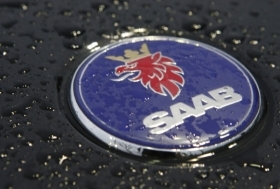 Meanwhile, Saab said Friday it reached a deal with one of its key suppliers and that production would soon be back to normal following a string of stoppages at its Swedish manufacturing plant. Saab was forced to stop production for a third day running on Thursday due to a dispute over payments with International Automotive Components Group (IAC), which supplies dashboards and other interior components. "We have solved all the issues with IAC," Saab spokesman Eric Geers said. "There was an agreement yesterday evening so this morning the plan is to get going on production as soon as possible." IAC had stopped deliveries due to the dispute. Saab was also forced to halt production earlier this week due to a payment dispute with transport company Schenker. Christer Palm, Chairman of Sweden's FKG association of car industry suppliers, said he had not heard of any new issues that could hold up production again, though he believed suppliers were somewhat cautious given this week's payment disputes. "I have spoken with some of the other suppliers and they seem to be satisfied even if there may be some delays," he told Reuters, noting that the delays were a matter of days rather than weeks. "There is no acute problem that I can see at the moment," he added. Geers said Saab hoped to get back to its more than 200-car-a-day production capacity as soon as possible. Separately, Saab said registered sales of its cars in Sweden, one of its top markets, had risen 129 percent in March to 888 units from a trickle last year as the company's fate hung in the balance.